One Third of the Largest Continuous Areas of the HMT network along with Pocahontas and Pinnacle Creek trail systems and connectors. Located near Ashland, WV, the Indian Ridge Trail System offers a nice variety of trails of all difficulty levels. This trail system offers community access to the ATV-friendly towns of Northfork and Keystone. Nearby communities offer gas, food and lodging. 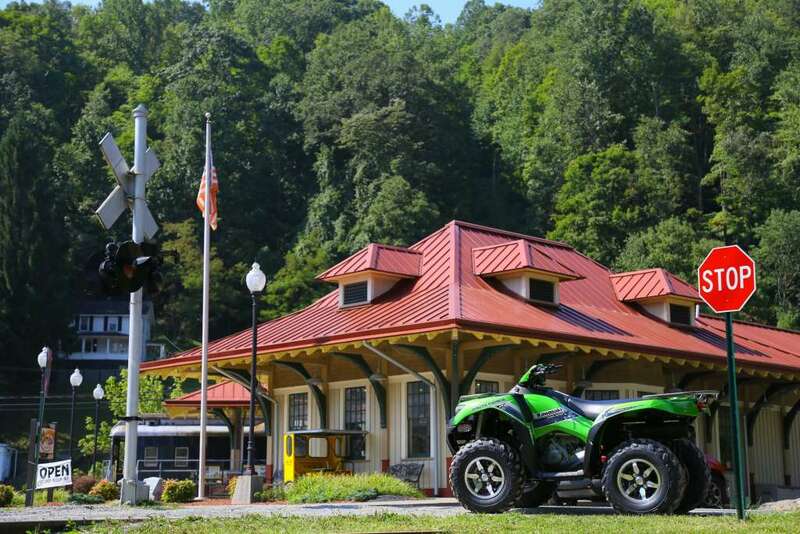 The trail system also connects with two other Hatfield-McCoy Trail Systems—Pinnacle Creek and Pocahontas—to allow extended off-road trips. Located in the town of Ashland, WV, near Northfork, WV. Has a 2+ acre parking lot and on site restrooms. This trailhead is NOT staffed. Permits and merchandise can be purchased at Ashland Resort which is directly connected to the system and is the nearest business to the trailhead. Come and stay in the most historic home in Ashland, West Virginia. The house was built for the Ashland Coal and Coke medical doctor in 1920. My grandparents purchased the house in 1965 after Dr. Torregrosa died and they have lived there for 52 years. We spent every summer in this house and loved spending time in the beautiful mountains that surround it, so we purchased the house to keep it in the family. Now you can share the same experiences! Our home features lodging to accommodate 20 guests. We have the cleanest, most updated (with WIFI) house in Ashland at very reasonable rates! We are located 1/4 mile from the trail head and 20 yards away from the recently updated Ashland Company Store! Book now for an unforgettable ATV adventure! Open 7 days a week, 8:30a.m. - 8:00p.m. Wild Willy's ATV Tires & Parts stocks a large inventory of atv and utv parts & tires. We stock tires, rims, axles, drive belts, wheel bearings, starters, solenoids, batteries, ball joints, tie rod ends, brakes, bushings, Polaris & Maxima fluids, motorcycle tubes, chains, goggles, helmets and much more. Specializing in tires and tire repair. Don't let a breakdown ruin your trip. Call Willy at 304-862-2312. Located in the West Virginia wilderness, this is a private area that connects to the Indian Ridge Trail System and various other local sites. Perfect for a getaway weekend, bring your ATV to take advantage of the natural beauty that is Keystone, West Virginia. Come stay our three bed, two bath single wide with three full beds, one twin bed, and a pull out couch. If you are looking for something a bit roomier, we also have a three bed, two bath double wide with six full beds, one twin beds, and a day bed. Once you park and unload, you can ride your machine everywhere. Just bring yourself, your friends, your family, and most importantly, your ATV. Everything else is here for you.